Sticking to your diet while enjoying yourself at a football party isn’t always an easy thing to do. Here are some suggestions to help you eat healthier this year. Fruits and veggies make a great appetizer and are popular at parties. Try a plate full of these instead of a handful of chips. Really change up the spread and incorporate Mediterranean foods on the table this year. 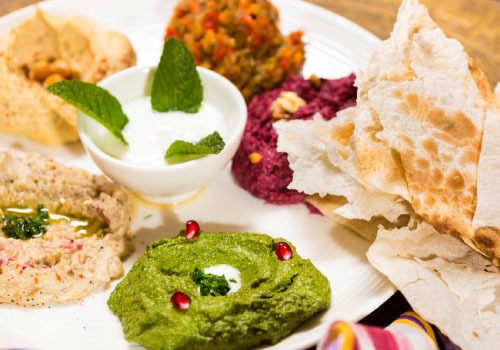 Pita, hummus, tabbouleh, garlic dip and baba ghanoush are great tasting and good for you too. If dip is a must for you and your snacking pleasure, make sure you are reaching for healthier options, like salsa or guacamole. If making a dip that calls for sour cream, try using mashed white beans, they offer a similar taste and consistency but are much better for you. Consuming Greek yogurt provides higher protein levels than ordinary yogurt, contains probiotics that are good for digestion, and can help lower blood pressure. Use it in place of sour cream in any recipe. Try making Greek yogurt parfaits as the dessert for your guests to enjoy this year. The combination of yogurt, fruit, nuts and/or granola is delightful! Substituting ground turkey for ground beef in recipes is a great way to cut down on unwanted fats. Chili is always a big hit at parties. The majority of the ingredients are healthy, and if the ground beef is replaced with ground turkey, the warm and fulfilling dish won’t break the scale. How something is prepared changes its nutritional value. Ask if the Buffalo Wings are baked instead of fried as the baked version is the healthier option.